In this tutorial, we will show you how to change your hostname on a Debian operating system. Changing the hostname of your Debian server is a very easy task and if you carefully follow the instructions provided in this tutorial it will take you no longer than 5 minutes to do it. The hostname is a label that is assigned during the initial server setup and it is used to identify and easily distinguish one server from another. When choosing your hostname you should also make sure to use a Fully Qualified Domain Name (FQDN) and it should be pointed to your server IP address so you can access your server by using it. Before you change your hostname, you will first need to connect to your Debian server via SSH. Make sure you replace “new.hostname.com” with the hostname you would like to use. This will change your hostname but only until next server reboot. On Debian based systems, the hostname of the system is stored in the /etc/hostname file. Upon server boot, the hostname contained in this file is assigned to the system by the init script located at /etc/init.d/hostname.sh. Change the hostname, save the file and exit the text editor. This will also permanently update our hostname even after a server reboot. If you use one of our Linux Support Services, you don’t have to change your hostname yourself, you can simply ask our expert Linux admins to change the hostname on your Debian VPS for you. They are available 24×7 and will take care of your request immediately. PS. 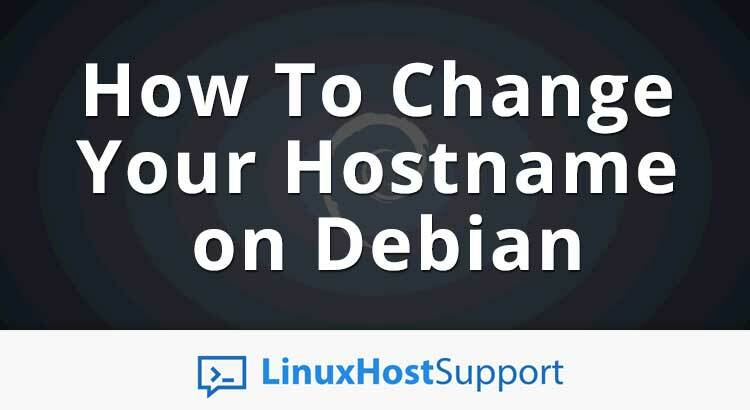 If you liked this post on How To Change Your Hostname on Debian, please share it with your friends on the social networks using the buttons on the left or simply leave a reply below. Thanks.